The Fantasy Springs Resort Casino in Indio, California was the host site for tonight’s Golden Boy Boxing on ESPN Card. 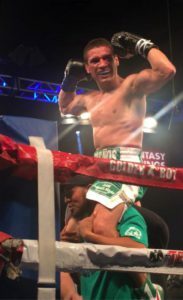 The junior welterweight division was featured heavily and included a main event between Fidel Maldonado Jr. and Ismael Barroso and a co-main event of Pablo Cesar Cano and Marcelino Lopez. The opening bout of the telecast was between Pablo Cesar Cano (30-6-1) and Marcelino Lopez (32-2-1) in the junior welterweight division. The crowd was noticeably thin when this bout started. Pablo Cesar Cano came out aggressively and attacked the body and head of Lopez. Lopez kept a high guard and was landing punches of his own, but Cano was the aggressor, but was swinging a little wildly. Both boxers had cuts in the opening round. Cano continued to be the aggressor in the second round, but Lopez landed a vicious overhand right followed by a left hook that sent Cano crashing to the mat. Cano was able to get back to his feet but was still wobbly and the referee stepped in to stop the fight. Marcelino Lopez wins by TKO at 2:27 of the second round. The next bout of the night was between Marvin Cabrera (5-0) and Hector Velazquez (57-29-3) in the junior middleweight division. Velazquez was 42 years old and Cabrera was 24. The age difference was very apparent early on as Cabrera was landing combinations almost at will. Velazquez plodded around the ring and was unable to catch up to the much quicker Cabrera. Velazquez however showed he had a good chin and was able to take some of Cabrera’s best punches, including some hard uppercuts. Velazquez was showing signs of tiring, but was still in the bout and on his feet when Cabrera landed a few shots on Velazquez by the ropes when Velazquez’s corner threw in the towel. It may have been stopped earlier than it should have been, but even if it continued Cabrera was in no danger of losing. Marvin Cabrera wins by TKO at 1:27 of the fourth round. The main event of the night was between Fidel Maldonado Jr. (24-3-1) and Ismael Barroso (19-1-2) in the junior middleweight division. Both boxers came out in a southpaw stance and Barroso was landing the cleaner punches in the opening round and put Maldanado on the defensive. Maldanado took more risks in the second round but Barroso appeared to be landing the harder shots. Maldanado started off the third round by fighting on the outside but got tagged with a left hand by Barroso that put him on his knees. He was badly hurt and on his feet for the remainder of the round, but he had to hold on to survive. Maldanado’s legs were still wobbly in the fourth round and he was in pure survival mode and lost a point for holding. Barroso continued to land well to the body and head in the fifth round and opened up a cut under the right eye of Maldanado. There was a brief pause in action before the start of the sixth round for the ring side doctor to look at Maldanado, but he allowed the fight to continue. Maldanado was taking some of Barroso’s best shots to the head pretty well in the sixth, but a short-left hook to the body of Maldanado sent him to the mat for the full ten. Ismael Barroso wins by knockout at 2:23 of the sixth round. Cuban strong man Fidel Castro died this weekend. Some are undoubtedly saddened, others – many others – joyous. Me? Well, truth be told, I’m no expert on Cuban history. I know that the government Castro overthrew was far from good to its people. Yet I also know Castro was a cruel guy…as in lots of dead bodies cruel. Interesting, sure? Charming? No doubt. But deeply cruel. Yet I find myself thinking a lot about the man’s impact on the sport of boxing here in the immediate days after his death. For Castro, in his own way, cast a long shadow over the sweet science. To be sure, Cuba has long had an illustrious history in the ring. However, after Castro’s successful overthrow of the Batista regime, professional sports were banned on the island nation. Why get paid in money, the argument went, when you can represent and earn the love of millions of your countrymen? Some might argue that people could do both, but no matter. Cuban athletes became more than just athletes – they became national symbols. This was particularly true in the case of boxers. For Cuban amateurs were a dominant force in the international boxing scene for decades. Indeed, it was Cuban fighters who were known to be masters of three round, Olympic style boxing. And they had the medals and awards to prove it. Yet there was, of course, a flip side to the coin. What did Cuban pros get for all their hard work besides government approved adulation? Didn’t other top fighters from around the world get adulation, as well…along with lots of money? Under Castro, Cuba was long-suffering economically. A lack of American business, along with the eventual fall of the Soviet empire, really harmed the nation’s (but perhaps not Castro’s) wallet. And so many Cuban fighters did what fighters have been doing since they started getting paid to fight – they worked to make life better for themselves. These words may come across as hokey, but facts are facts. Notable boxers, including contemporaries like Guillermo Rigondeaux, Erislandy Lara and Yuriorkis Gamboa defected from Cuba…against the will of Castro’s government. 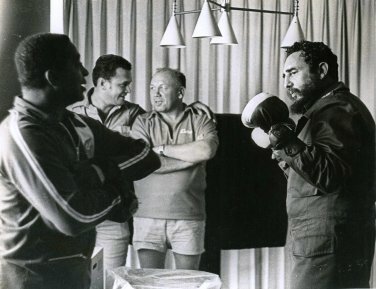 Make no mistake about it, Cuban boxers excelled athletically during the Castro regime. To argue otherwise is to become too partisan for one’s own good. But Castro’s unwillingness to let Cuban fighters reach their potentials in the pro ranks was simply wrong. And it had an overall negative impact on the sport in general. Who knows, after all, what the world of pro boxing lost out on due to an oppressive dictator’s stubbornness?